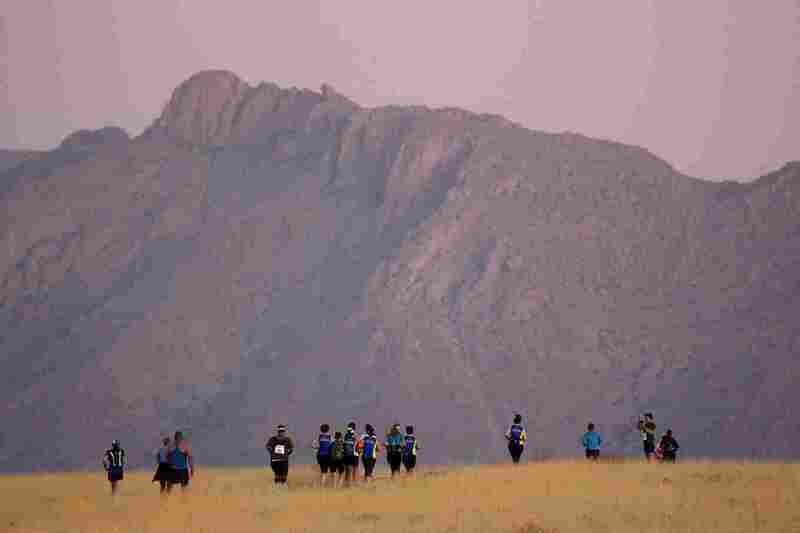 The Brandberg Rhino Run takes place within the Tsiseb Conservancy in Damaraland, northwestern Namibia. 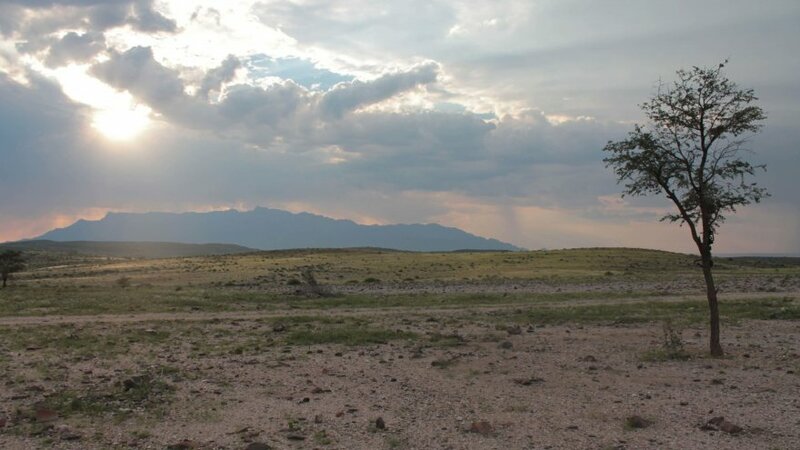 Damaraland and the neighboring Kunene region comprise the habitat of the last population of desert adapted black rhino. Here, rhinos roam free along with the desert adapted African elephant, lion, hyena, cheetah, zebra and many more animal species, making this the wildest trail run in Namibia! The event is hosted as a fundraiser for the non-profit organization, Save the Rhino Trust (SRT) Namibia. This NGO deploys field teams to protect the rhinos from the poaching predicament that is threatening to drive the species to extinction. The event is set within the foothills of the Brandberg, the highest mountain in Namibia, with exquisite panoramas from every hill top. 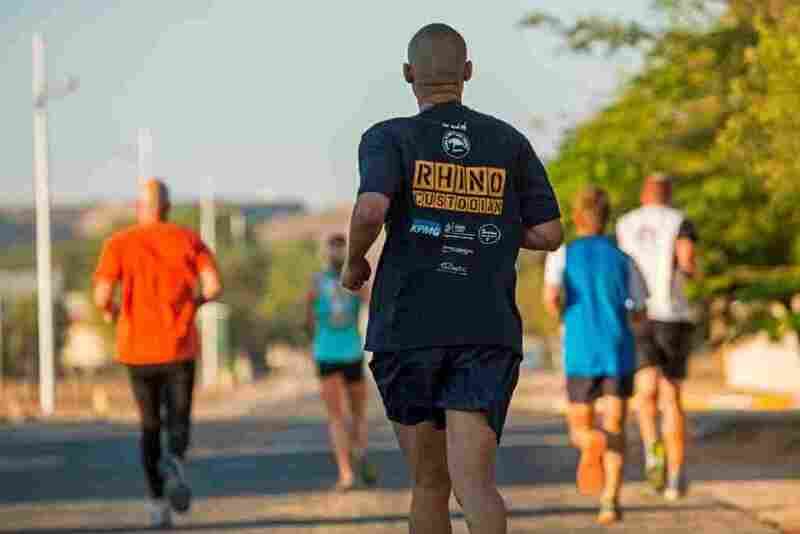 The Rhino Run offers a 7 km for the sprinters, walkers and the fun-runners, and a 13 km and 27 km option for those who like to get more sweat and photos for their entry fees. Brandberg Rhino Run. Photo by KAT Imaging. All three routes comprise a fair blend of deep, sandy riverbeds, jagged rocky outcrop and some spots of loose scree and rocky rubble. No previous trail experience is necessary but although large parts of the trail is on well-defined jeep tracks, this is no run in the park. Runners carry all of their own water and only one checkpoint with emergency water is located on each of the routes. RunnerClick had a chance to reflect with Uschi Ramakhutla on her first Rhino Run experience in 2015, which was also her very first trail run. Ushci, 44, felt a pressing need to live by example to her young nieces and nephews by playing her part in conserving the rhino species by doing the Rhino Run. She entered the 7 km option and finished as first lady home in a time of 1hr 22min. Uschi after the Rhuno Run (left) and her niece, Naledi. Photos courtesy of U. Ramakhutla. RunnerClick: Why did you start running? Uschi: Before I commenced training for the Rhino run I last ran at school, before 1990! I wanted to take part in the Rhino Run as I felt it was the only way I could contribute to raising funds in aid of fighting the poaching of rhinos in Namibia. My inner resistance to traveling on foot and being dead tired (for fun!) didn’t cut it as a good enough reason to just see an entire species of animal die out. RunnerClick: How did you train for Rhino Run. Did you follow a program? 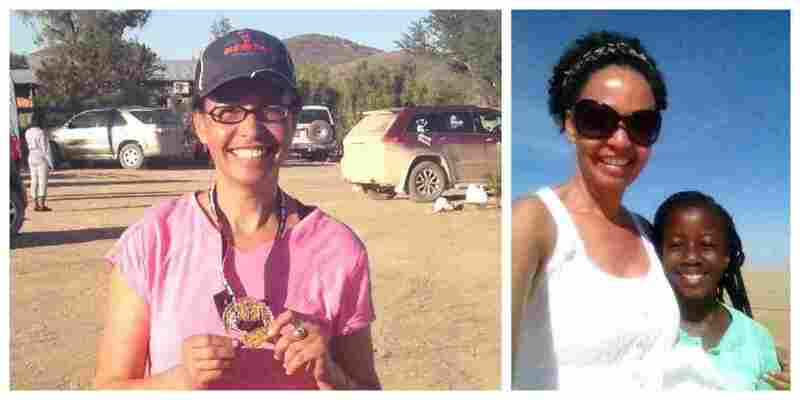 Uschi: I knew I needed to follow some fitness program in order to get to the finish line before sunset, and I sure wasn’t going to be the last person in. So I called up an athlete friend for a program to get me fit in six weeks for a 7 km run. Six weeks of sweat, tears (real tears!) and early morning runs (I am not a morning person!) I ran along the beach in the mornings and added a weekly bike-ride for good measure. My first day of training required a two minute slow walk followed by a two minute fast walk for about 40 minutes. By the time I got back home, I didn’t know whether I was doing a slow or fast walk. I was just thankful that I was still on my feet as the urge to crawl the last 200m was huge! I’m one of those people who’ll join a gym with all good intentions and only go the first 8 days, so I committed myself to chronicle my training experience on Facebook. This meant that friends and family were holding me accountable. It was during her self-inflicted suffering while training for the Rhino Run that Uschi came up with a fundraiser idea. Uschi owned an arts and crafts store at the time, and proposed to a street artist friend, Zin Maisiri, that she would supply him with materials if he could create rhino-inspired works of art. The two of them donated 60 percent of all proceeds to Save the Rhino Trust. Zin also donated a painting that was auctioned the night before the Rhino Run event, and raised a significant cash donation in that way. 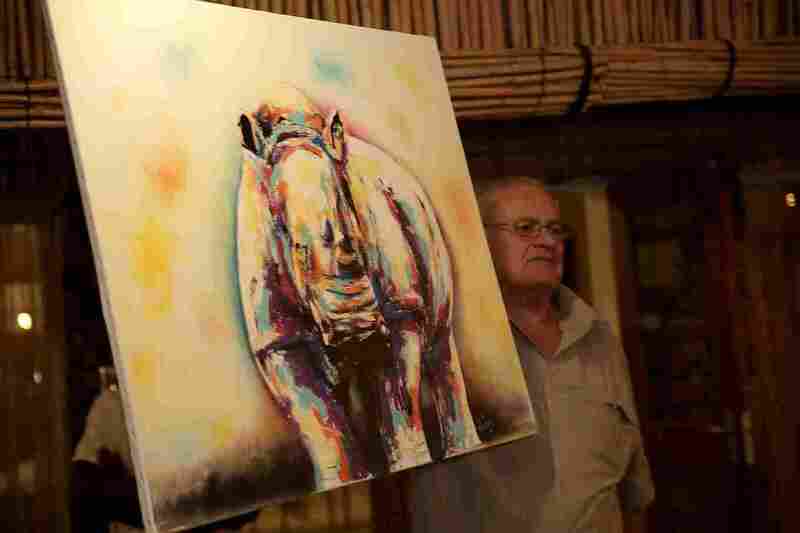 Rhino painting by Zin Maisiri. Photo by KAT Imaging. Uschi: Running and training for the Rhino Run made me aware that we don’t have to gear up in camouflage to ambush poachers or donate a lot of money to contribute to saving the rhino (or whatever cause pulls at our heart-strings). All we need to do is work with what we have, and every little bit helps. RunnerClick: What did you like about the race itself? Uschi: I loved that nobody knew me at the race start, so I could suffer anonymously! RunnerClick: What did you like about the route? Uschi: The run was a massive challenge for me. The rocky trails followed by the deep river sand sure made the training worth the while. The routes were well marked, which was a huge help as I was dreading taking the 12 km route by accident, heavens forbid! RunnerClick: What were are the tough parts of the route? Uschi: Running in itself is tough if you’re not a runner. Apart from the river sand which I ran/walked through, it wasn’t a difficult route. I was inspired by the public commitment I made to finish the run and by my potential guilt should the rhino go extinct and I didn’t do anything to contribute to its safekeeping. 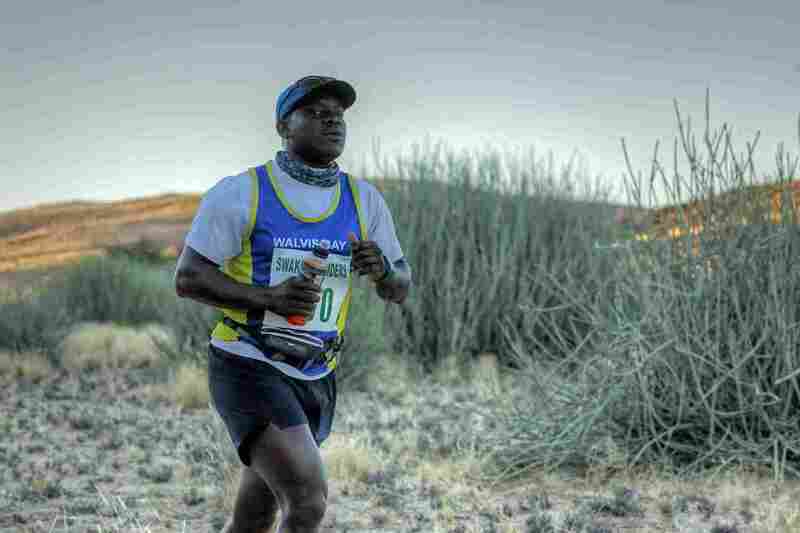 I had fun once I was through the sandy riverbed, and decided then and there to make it my thing, to run for the rhinos. RunnerClick: Any special advice you can give to novices planning to do the Brandberg Rhino Run? Ushci: Don’t start training six weeks before the race like I did. Give yourself a headstart and train at least three months before the time. Be forewarned that almost half of the 7 km and 13 km routes are comprised of deep river sand, and that you have to carry enough water. Invest in proper running shoes. The right shoes may make all the difference, especially on the rocky sections. And don’t forget the sunblock, the Namibian sun has no friends!